How Much Will it Cost to Build an Arbor? 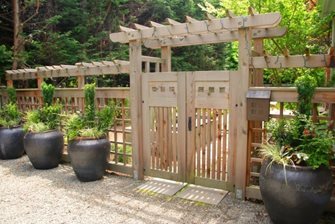 High quality cedar and redwood are the preferred materials for custom arbor gates with outstanding carpentry and detailing. This prefabricated arbor was installed after these stone veneer seatwalls were constructed, making the structure a visual part of the masonry. To ease the transition from sidewalk to a two story facade, this freestanding arbor is wired for lighting that makes it safer after dark. Narrow arbors make a perfect gateway for a sideyard or as a portal between backyard "rooms" in the landscape. An arbor is simply any overhead structure built to frame a portal in the landscape. Some include gates or are attached to fences, while other groups are flat top designs compared to others perfectly arched overhead. 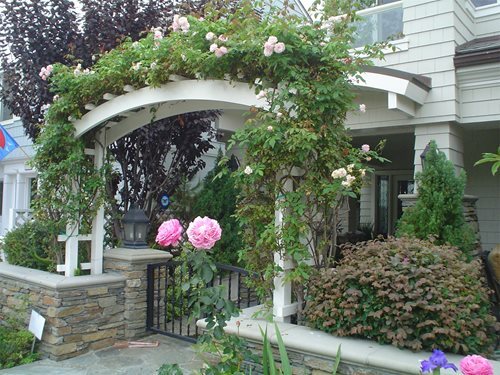 An arbor in the hands of a competent designer is a powerful tool for directing the eye and traffic within a landscape. It intuitively helps visitors find their way to these important transition points. The traditional overhead design evolved to support a bower of fragrant flowering vines that makes you want to walk through its lush beauty and perhaps experience a delicious scent as you pass. 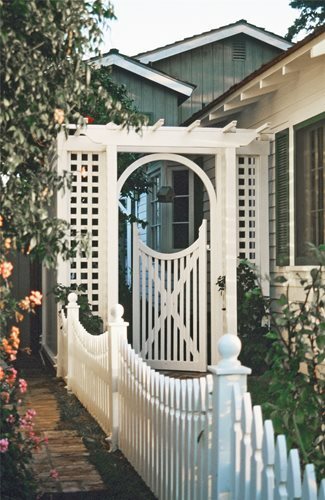 Arbors on the entry walk to your front door are larger and more massive to remain in scale with the space and facade. They help you visually separate the front yard from public space beyond. 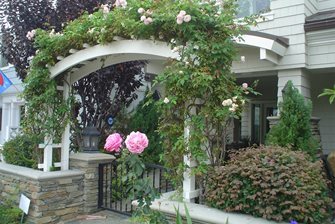 Arbor structures can be custom made by your contractor using everything from redwood to stone or stucco and other materials that reflect your home's architecture. It may be integrated into a fence or wall and upgraded with security gates. 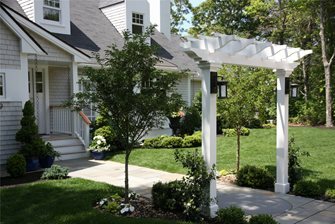 The more affordable choice is to install your arbor from a prefabricated kit made of metal, low maintenance white vinyl, and cedar wood. The arbor may be freestanding, or attached to a fence with gates. Prefab arbors for the front yard will be 60 to 80 inches wide on the inside to span a four to six foot wide walk. The rest are narrow arbors designed for backyard and sideyard applications that average 42 to 48 inches wide. This easily spans a three foot path or sidewalk. Contractor Built Custom ArborsA custom arbor must be designed, and then constructed by a licensed contractor. Not only will it feature special wood work overhead, there special columns, pilasters and posts built from scratch add up. That's why it's hard to pin point costs on these structures because they are so variable. In general, an all wood entry arbor runs about $1000 to $3,000. Prices climb steeply when the structure is made of tubular or square steel, or features complex carpentry or unique wood such as ipe or teak. Prefabricated and Kit ArborsThe benefit of these prefab arbors is that they feature really great designs that have proven themselves over time. In general, flat top arbors cost about the same as arch top designs. Material choices influence cost. 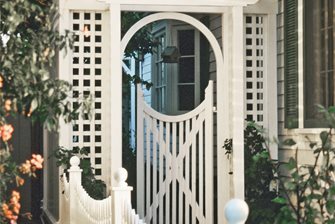 Vinyl is the preferred material for white arbors rather than painted wood that can flake and fade. Cedar kits are designed to weather naturally or be treated with a transparent stain. Metal today can be powder coated for rust control, color and style. Overall, allow $200 to $300 for assembly and installation of prefabricated arbor.